Download "Assurance and accounting A Guide to Financial Instruments for Private"
1 june Assurance and accounting A Guide to Financial Instruments for Private Enterprises and Private Sector t-for-profit Organizations For many entities adopting the Accounting Standards for Private Enterprises (ASPE), the accounting for Financial Instruments will be one of the most significant changes in their financial statements. Understanding the accounting for financial instruments is critical for all entities, as even the simplest entities have financial instruments. All of the accounting requirements related to financial instruments are contained in Section 3856, Financial Instruments of Part II of the CICA Handbook - Accounting 1. 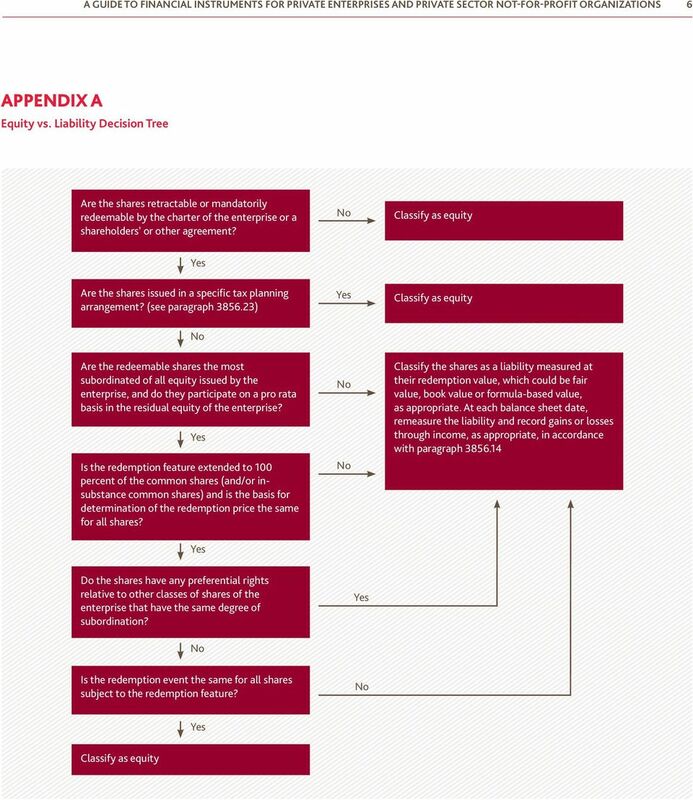 Under prechangeover GAAP, the accounting for financial instruments was covered by a series of standards, accounting guidelines and EICs; ASPE has simplified this by grouping the majority of accounting requirements for financial instruments under one standard. This publication will cover all aspects of Section 3856 other than Hedge Accounting. For guidance on hedge accounting, see our publication A Guide to Hedge Accounting for Private Enterprises. Scope A financial instrument is defined as a contract that creates a financial asset for one entity and a financial liability or equity instrument of another entity. To understand this definition we must also define a financial asset, financial liability and equity instrument. They are defined as follows: A financial asset is any asset that is cash; a contractual right to receive cash or another financial asset from another party; a contractual right to exchange financial instruments with another party under conditions that are potentially favourable; or an equity instrument of another entity; A financial liability is any liability that is a contractual obligation; to deliver cash or another financial asset to another party; or to exchange financial instruments with another party under conditions that are potentially unfavourable to the entity; and An equity instrument is any contract that evidences a residual interest in the assets of an entity after deducting all of its liabilities. Common examples of financial instruments include: Cash; Demand and fixed-term deposits; Commercial paper, bankers acceptances, treasury notes and bills; Accounts, notes and loans receivable and payable; Bonds and similar debt instruments, both issued and held as investments; 1. This publication is also applicable to t-for-profit organizations adopting Part III of the CICA Accounting Handbook. They are also required to follow Section 3856 from Part II of the Handbook. 2 A Guide to Financial Instruments for Private Enterprises and Private Sector t-for-profit Organizations 2 Common and preferred shares and similar equity instruments, both issued and held as investments; and Options, warrants, futures contracts, forward contracts, and swaps. In general, Section 3856 applies to all financial instruments; however, there are some financial instruments which are excluded from the scope of the standard. Most of these exclusions relate to instruments which meet the definition of a financial instrument; however, the accounting for these items is determined by another standard (for example, lease accounting) 2. Contracts to buy or sell non-financial items other than exchange traded futures contracts and contracts that are designated in a qualifying hedging relationship are an important scope exclusion. These contracts do not meet the definition of a financial instrument because the contractual right of one party to receive a non-financial asset or service and the corresponding obligation of the other party do not establish a present right or obligation to receive, deliver or exchange a financial asset. Recognition and Measurement Initial Measurement Upon initial recognition, all financial instruments originating in an arm s length transaction are to be measured at fair value. In most cases, this amount will be the amount of consideration paid or received, as fair value is defined as a price agreed upon by a willing buyer or seller in an arm s length transaction. In situations where there is a difference between the consideration paid or received and the fair value of the instrument, the difference should be recognized immediately in net income unless it qualifies as some other type of asset or liability. For example, when an entity receives an interestfree loan from a government agency, in the absence of evidence to the contrary, the difference between the fair value of the loan and the cash received is accounted for as a government grant. Similarly, when an entity extends an interest-free loan to an employee, in the absence of evidence to the contrary, the difference between the fair value of the loan and the cash paid to the employee is accounted for as employee compensation. In the case of financial instruments that originate as a result of a related party transaction, initial measurement will be at exchange amount or carrying value in accordance with Section 3840, Related Party Transactions, rather than fair value. If the sole relationship is in the capacity of management, the parties involved are deemed to be unrelated for purposes of Section 3856 and as such, transactions will be initially measured at fair value. At the time of initial measurement, transaction costs must also be considered. For instruments that are subsequently measured (see below) at cost or amortized cost, the amount initially recognized will be adjusted for transaction costs directly attributable to the instruments origination, acquisition, issuance or assumption. Otherwise transaction costs shall be recognized in net income as incurred. 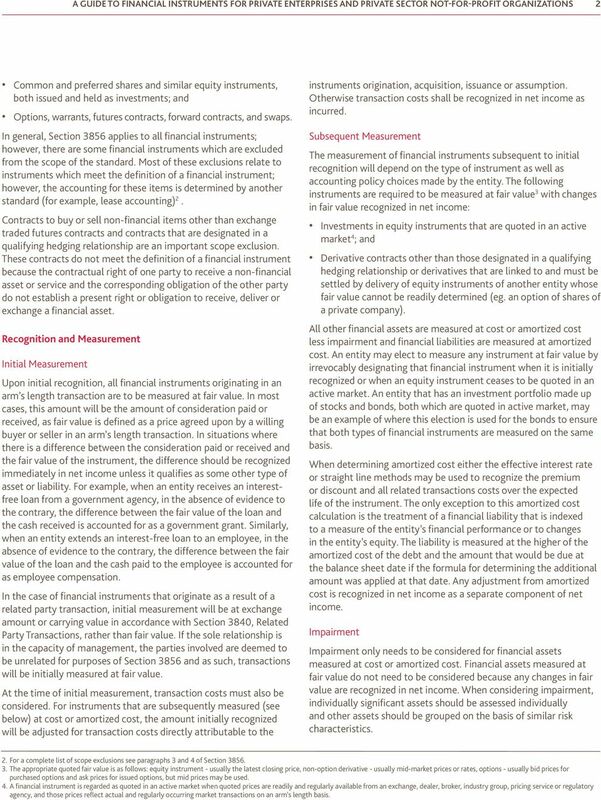 Subsequent Measurement The measurement of financial instruments subsequent to initial recognition will depend on the type of instrument as well as accounting policy choices made by the entity. The following instruments are required to be measured at fair value 3 with changes in fair value recognized in net income: Investments in equity instruments that are quoted in an active market 4 ; and Derivative contracts other than those designated in a qualifying hedging relationship or derivatives that are linked to and must be settled by delivery of equity instruments of another entity whose fair value cannot be readily determined (eg. an option of shares of a private company). All other financial assets are measured at cost or amortized cost less impairment and financial liabilities are measured at amortized cost. An entity may elect to measure any instrument at fair value by irrevocably designating that financial instrument when it is initially recognized or when an equity instrument ceases to be quoted in an active market. An entity that has an investment portfolio made up of stocks and bonds, both which are quoted in active market, may be an example of where this election is used for the bonds to ensure that both types of financial instruments are measured on the same basis. When determining amortized cost either the effective interest rate or straight line methods may be used to recognize the premium or discount and all related transactions costs over the expected life of the instrument. The only exception to this amortized cost calculation is the treatment of a financial liability that is indexed to a measure of the entity s financial performance or to changes in the entity s equity. The liability is measured at the higher of the amortized cost of the debt and the amount that would be due at the balance sheet date if the formula for determining the additional amount was applied at that date. Any adjustment from amortized cost is recognized in net income as a separate component of net income. Impairment Impairment only needs to be considered for financial assets measured at cost or amortized cost. Financial assets measured at fair value do not need to be considered because any changes in fair value are recognized in net income. When considering impairment, individually significant assets should be assessed individually and other assets should be grouped on the basis of similar risk characteristics. 2. 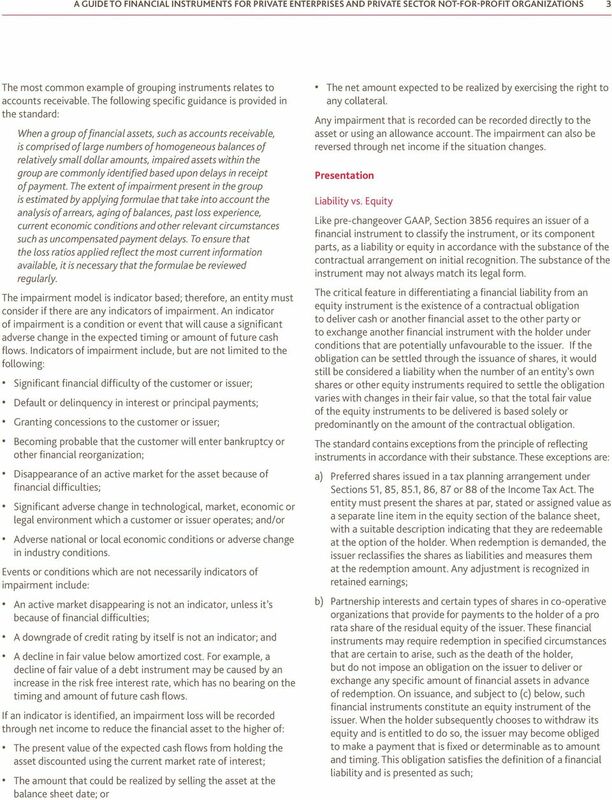 For a complete list of scope exclusions see paragraphs 3 and 4 of Section The appropriate quoted fair value is as follows: equity instrument - usually the latest closing price, non-option derivative - usually mid-market prices or rates, options - usually bid prices for purchased options and ask prices for issued options, but mid prices may be used. 4. A financial instrument is regarded as quoted in an active market when quoted prices are readily and regularly available from an exchange, dealer, broker, industry group, pricing service or regulatory agency, and those prices reflect actual and regularly occurring market transactions on an arm s length basis. 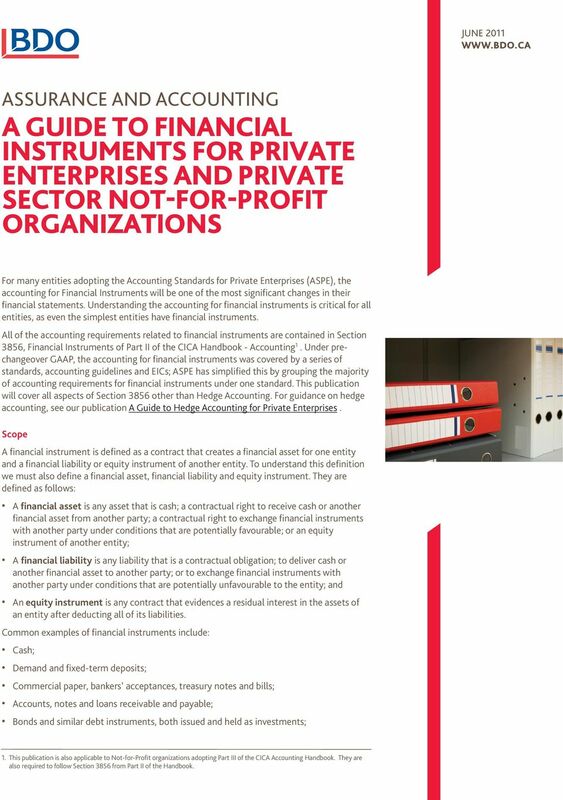 5 A Guide to Financial Instruments for Private Enterprises and Private Sector t-for-profit Organizations 5 instruments to the entity s financial position and performance. This includes disclosure of the entities exposure to risk, how risk arises and changes in risk exposure for the previous year for credit, currency, interest rate, liquidity and other price risk. Included in these risk disclosures would be a description of any concentrations of risk. Concentrations of risk may arise from industry sectors, geographic distributions, credit qualities and a limited number of counterparties. First-Time Adoption Section 1500, First-Time Adoption, will be very important as entities transition from pre-changeover GAAP to ASPE 5. Although Section 1500 generally requires retrospective adoption of ASPE, it does provide exceptions and exemptions from retrospective application. 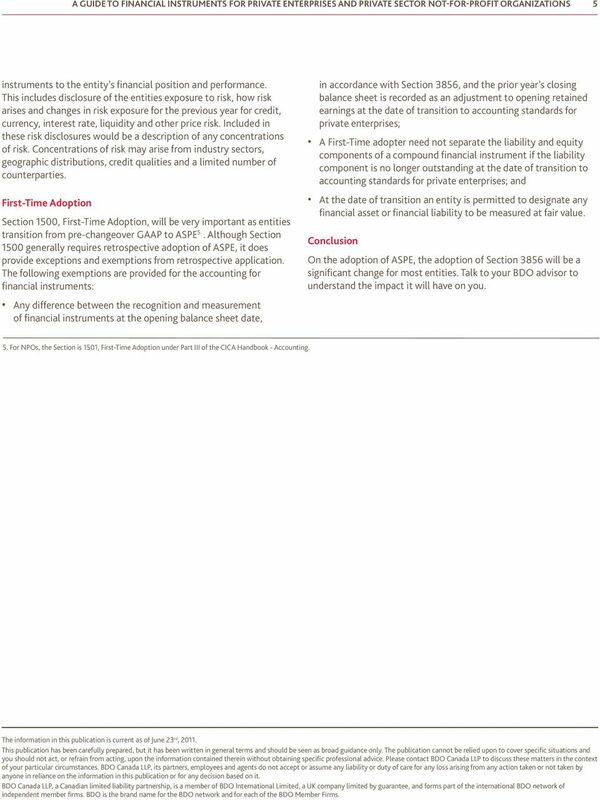 The following exemptions are provided for the accounting for financial instruments: Any difference between the recognition and measurement of financial instruments at the opening balance sheet date, in accordance with Section 3856, and the prior year s closing balance sheet is recorded as an adjustment to opening retained earnings at the date of transition to accounting standards for private enterprises; A First-Time adopter need not separate the liability and equity components of a compound financial instrument if the liability component is no longer outstanding at the date of transition to accounting standards for private enterprises; and At the date of transition an entity is permitted to designate any financial asset or financial liability to be measured at fair value. Conclusion On the adoption of ASPE, the adoption of Section 3856 will be a significant change for most entities. Talk to your BDO advisor to understand the impact it will have on you. 5. 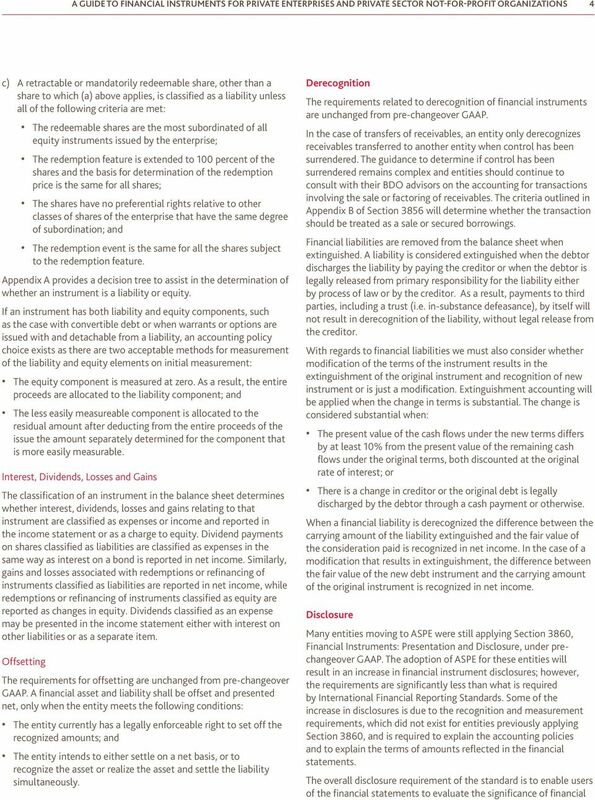 For NPOs, the Section is 1501, First-Time Adoption under Part III of the CICA Handbook - Accounting. The information in this publication is current as of June 23 rd, This publication has been carefully prepared, but it has been written in general terms and should be seen as broad guidance only. The publication cannot be relied upon to cover specific situations and you should not act, or refrain from acting, upon the information contained therein without obtaining specific professional advice. Please contact BDO Canada LLP to discuss these matters in the context of your particular circumstances. BDO Canada LLP, its partners, employees and agents do not accept or assume any liability or duty of care for any loss arising from any action taken or not taken by anyone in reliance on the information in this publication or for any decision based on it. BDO Canada LLP, a Canadian limited liability partnership, is a member of BDO International Limited, a UK company limited by guarantee, and forms part of the international BDO network of independent member firms. BDO is the brand name for the BDO network and for each of the BDO Member Firms. (Amounts in millions of Canadian dollars except for per share amounts and where otherwise stated. All amounts stated in US dollars are in millions. 2 This Standard shall be applied by all entities that are investors with joint control of, or significant influence over, an investee.